It was a much more comfortable and considerably higher standard experience than I had anticipated. In fact it was a totally positive experience to the extent that from now on when I stay in the Lakes, YHA will be my automatic choice for accommodation whenever possible. Added to which it was incredible value for money and the staff were brilliant. When would you like to stay at YHA Ambleside? 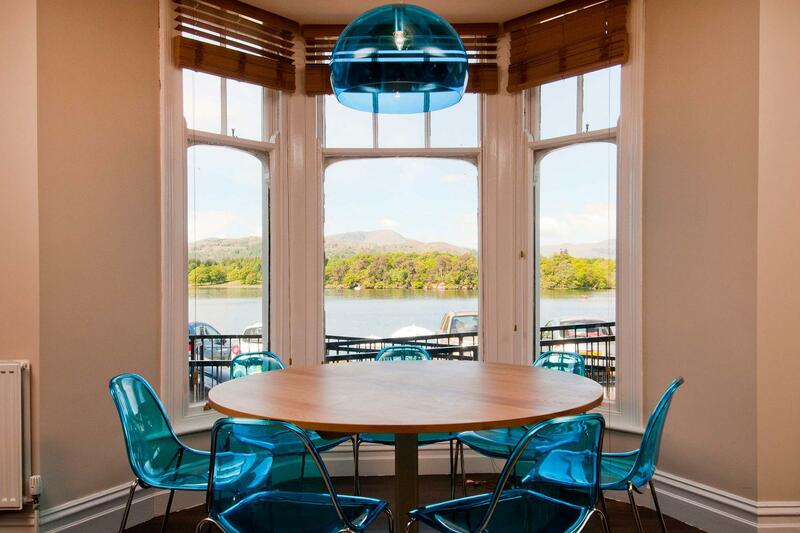 Situated right on the shores of Windermere, this stylish Youth Hostel offers an unbeatable location, stunning views and state of the art facilities for families, groups and solo travellers to enjoy. In the centre of the Lake District National Park and within walking distance of the charming village of Ambleside, YHA Ambleside gives you easy access to prime walking, climbing and watersports in the Lake District. Plus, with a modern bar and restaurant serving great food and local ales, return to the hostel confident you’ll be catered for. This modern 249 bed accommodation has both private and dorm rooms, some of which are en-suite. - Bedrooms at YHA Ambleside are across three floors. Please be aware that there is no lift in the hostel. YHA Ambleside has one ground floor accessible room which can only be booked by calling the hostel directly. Our Lakeside Restaurant & Bar provides a contemporary, relaxed and cosy atmosphere right on the shores of the beautiful Lake Windermere. Offering a broad selection of delicious food, alongside a range of freshly made hot drinks and a well-stocked bar. Open daily to guests and passers-by, let us welcome you to rest your legs and indulge your senses after the day’s adventure. Choose from our tasty daily specials or delve into our café-bar style menu experience, think scrumptious bar snacks, light bites, stone-baked pizzas and piled-high burgers. Kids under 10 eat free with every main meal purchased from the menu. Enjoy the wonderful aroma of freshly baked gingerbread and sample the delights inside the tiny shop. There's a great choice of high and low level walks in the area, from easy walks around the beautiful Troutbeck Valley to the high fells in the east. Enjoy an afternoon on England's largest natural lake. There's a watersports centre on the shore of Windermere, only three miles from the hostel. Tom Ghyll (or Gill) is a lovely stream with two waterfalls. A trail runs alongside the stream and the path then leads up to Tarn Hows. Start at the Car Park on the A593 by Glen Mary Bridge. Parking: The property has a small car park. If this is full when you arrive there is limited on-street parking in front of the pier and on Lake Road (3 minute walk). There is also a pay and display car park two minutes' walk from the hostel on Borrans Road (2 minute walk) which offers free parking from 18:00 - 08:00. Pets: Pets are not permitted at YHA Ambleside. Assistance dogs are welcome. There are a range of educational and action/adventure packages available at YHA Ambleside. The hostel has 249 beds, Internet access, classroom facilities, a library and group catering is available. Visit the YHA School Trips website to reserve the hostel for your field trip. At YHA Ambleside we have one meeting room available for hire - the Wainwright Suite. Capacity: Up to 20 delegates depending on seating configuration. Available Equipment: Projector, flipchart, pull down projection screen. Parking: There is limited parking at the hostel. More parking can be found in Ambleside village. Wi-Fi: There is no Wi-Fi in the conference room. Accessibility: There is step free access into the hostel and the meeting room is located on the ground floor. There is a step free route from reception to the room. The closest accessible WC is located in the café bar. For more information please see our full access statement. Air conditioning: There is no air conditioning but we do have fans and central heating. Manager recommends: Right in the heart of the Lake District, Ambleside is ideal for everyone, from first timers looking for weekend breaks to seasoned visitors who love serious outdoor activity holidays and want the best access to all that the Lakes have to offer - from climbing holidays to watersports holidays. Everything you need for great outdoor activity holidays or school trips! Watersports, walking, climbing and steamboat trips, it’s all here!